I received the hardcover book and CD titled Thanks, But No Thanks from Passkeys Foundation, which is part of their Good News Express series (scroll to the very bottom of the page). Other books in this series include one on friendship (The Special Wish), on giving (The Birthday Gift), and on having a good attitude (The Cheerful Grump). This series is intended for 3-5 year olds, so I sat down with Trina (3.5) and Richard (5.5) to read the book. I put in the CD, snuggled my kiddos up with me, and we listened to the book, actually. The CD totals 16 minutes, and includes four songs, which make up almost half of the total time. We did enjoy this. The sound effects were good, the reading was pleasant, and the story did hold their attention. I thought the songs were a little long, and my 5 year old thought so too. Trina loved it though! I can see putting this onto my iPod to listen to in the car, now that they have seen the pictures. The story has to do with how unpleasant things would be if nobody said thank you, and of course, everyone learns that lesson quite well. It was fun to listen to the story, and I appreciated that even though it is written to preschoolers, it uses reasonably complex sentence structure, and plenty of descriptive adjectives and adverbs. My fear with books like this is always that they are going to be so simplified and basic that I won't be willing to read them more than once or twice. One sentence, as an example, picked essentially at random: "Bramwell was surprised by Finney's remark, but he shrugged his shoulders and went back to work." I like being able to stop (when we read the book instead of listening to the CD) and discuss words like "remark" as we go. Reading the book also gave us the chance to discuss how it feels when you do something for someone and they don't seem to notice, and how important it is that people feel appreciated. Overall, this is a sweet book, and one we will pull out to read again. Passkeys also has a series called Character Billders for 7-12 year olds, Character Classics for 6-10 year olds, a different Character Classics series for 9-12 year olds, and a book called Kids of Character for adults. All are available in the Parts Department. You can also read a weekly character mentoring message at this blog. 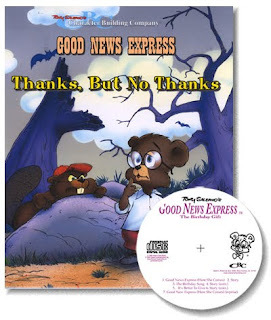 The Good News Express books are available for $7.50 individually, or the set of four for $20.